One fine day in August of 2015, after I had sustained some serious injuries from a motorcycle accident, a couple of my nieces and I decided it would be great to get out to the Unist’ot’en camp to show our support to our land defenders. I would often simply think about going, but I would make an excuse and put it off, knowing full well that I should be making my way out to show my support. I visited a couple of times before and just loved the environment. I was taken on a tour of the permaculture garden, the pit house and the living arrangements. This was very progressive compared to the first time I went up there. When I first went up. There was a cabin and many people lodging in tents. Everyone was like-minded. They were all there to defend our precious resources from the land and our rights and title to the land. It was evident, every step of the way. Now, like I said, there is a permaculture garden, pit house, tents, a mini-farm with goats and chickens, bunk houses, a cook shack/healing center a gathering place by the fire and the main cabin that houses the Unist’ot’en members. The change was great. Well, this last August, Aleah, Angie and I decided to just go. We went up and to our dismay, as we were driving up to the camp, we noticed people from our own nation working for industry right at the doorway to the Unist’ot’en. I felt disillusioned. We continued on our way and upon entering Unist’ot’en, we did the “Prior and informed consent,” welcoming protocol. Upon our welcoming, we were escorted to the cook shack where there was a hub of activity. A few people were milling around the fire. Others were in the cookshack preparing the next meal for the large crew. Others were doing their watchmen shifts out on the territory. I of course wanted to know where Freda was, so I could announce my presence. She was in the back, canning salmon. I limped to the back to the cook shack and came across an outdoor kitchen. I loved it. People were cutting and prepping salmon for canning. I basically asked my niece to bring me my bungey chair so I could sit comfortably. I rolled up my sleeves and set up a work station and assisted with the canning station. Aleah and Angie and the girls found other things to occupy their time while they were there. During the time I was working there, I literally rubbed shoulders with people from all walks of life. They all had one common goal. They were land defenders first and foremost. They were there to experience life ‘off the grid’ in the wilderness. Every person loved the experience. It was a phenomenal experience. Freda takes on the role of big sister, mother, administrator, guide and foreman. She will instruct on the spot when something is not working just the way she wants it to work. There is a kitchen crew. There is a farm crew. There is a garden crew. There is a berry picking crew, there is a watchmen crew. There is a wood cutting crew. There are the hunters and trappers. There is never a shortage of things to do, while assisting at the Unist’ot’en, home of Freda Huson. It is a hub of activity right from the get go. All in all, I was welcomed with the greatest hospitality. The Kitchen crew did a phenomenal job feeding us. In the evening, we were entertained by the fire with diverse topics of conversation. We met people from different nations. We were able to share some commonalities of culture and language. We were able to welcome hereditary chiefs to the territory. It was great. We stayed the night and we were housed in the bunk-house. I was awakened in the morning by the crow of the rooster. It was lovely. We got up, had breakfast. I helped with the breakfast dishes and then we started prepping for our journey home. My heart was full. In search of Freda that day, I found her at the smokehouse. She was cutting salmon. I said, I just came by to get a farewell hug. 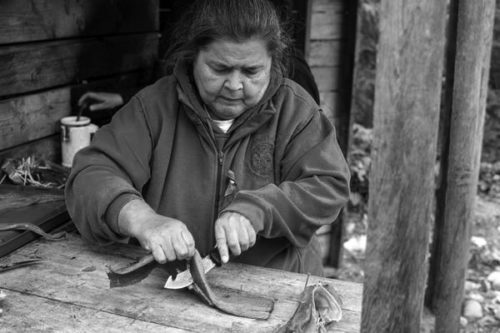 My niece inquired about making hux’m japan, a style of fish cutting that was passed on to our family from the Gitxsan. Within moments, I was rolling up my sleeves and holding a knife and cutting fish. Only to learn from Freda, that she already knew this technique. It was great. I washed my hands and continued on my journey. I would like to say. Thank you to the people of Unist’o’ten for allowing us the opportunity to feel so safe and grounded and in touch with nature. It certainly is an experience that revitalizes one’s soul.